Do you have a strong desire to become a professional musician, but are unsure about how to start a career in music? If so, you are not alone. Every day there are thousands of musicians just like you who are jumping head first into the music industry with high levels of enthusiasm but very little experience. Unfortunately, the vast majority of these musicians do not end up with a career in music because they either do not know how the music industry works or do not know how to use the information they learn to quickly advance their music career. In order to build and sustain a career in music it is important to seek out the training of a mentor who has already achieved a high level of success in the music industry. By finding someone who has already accomplished what you want to achieve in music (and is willing to guide you along), you will drastically increase your chances for success. To illustrate this point, think about the legendary basketball star Michael Jordan. Considered by many to be one of the greatest athletes ever, Jordan won many championships and awards throughout his career while making millions of dollars in the process. Although he certainly had talent on his own, he did not accomplish all of these things alone. Throughout Jordan’s career there was not a single moment where he did not have the guidance and training of a personal coach or mentor. By having access to people who had already achieved the things he wanted to achieve in basketball, Jordan was able to use his natural playing abilities to their full potential and reach truly legendary success in the sport. It would be unthinkable that any world-class athlete would proceed without a coach even after winning championships, MVP awards or Olympic gold medals. 1. Has already achieved a high level of success and can help you find solutions to the unique challenges you face in your music career. When you start a career in music, it can be very overwhelming. Fact is, there exists a nearly endless amount of information on the music industry through various forms of media (such as internet, books, etc.). The problem is, these sources usually offer generalized advice that is intended to appeal to musicians as a whole. This can be confusing for you as you are just starting a career in music, because you are not yet able to distinguish the valuable information that you can actually use from clutter that is totally irrelevant to your musical goals. That said, it is very important that you find a music career mentor who has already achieved a high level of success in the same area of the music business that you are looking to pursue (for example, recording successful albums, touring nationally or internationally, etc.). By finding a mentor like this, you will be able to get personalized advice that is 100% relevant to your specific goals in music. This person will not simply provide you with generalized advice. Instead, they will be able to answer your specific questions in order to help you overcome the challenges that are unique to your own music career. This will enable you to approach a career in music with a clear and focused understanding of the actions you need to take on a continual basis. 2. Understands how to guide you while keeping your biggest music goals in mind. 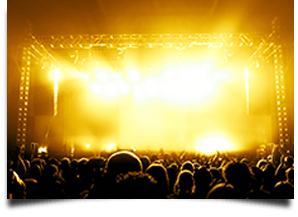 Grow your band's reputation and draw bigger crowds to your gigs. Get 6 free lessons on how to get more music career opportunities. One of the most common reasons why musicians fail to sustain a long term career in the music industry is that they do not keep their ultimate music goals in mind with each action they take – they easily become distracted and stray off course. These musicians start a career in music and go through the motions of practicing their instruments and writing music, but ultimately lose direction because they never really established a solid strategy for reaching their musical goals and then stick to that strategy with pig-headed discipline. This frustrating process can go on for years until finally the musician gives up entirely on a career in music and settles for an unsatisfying job outside of the music industry. A good music career mentor will be able to evaluate your goals and help you identify various strategies that you can use to reach them quickly and effectively. That said, even with all the right strategies in place, many musicians tend to slowly get off track from their goals due to lack of motivation, distractions or procrastination. When this happens, it can often lead to a career in music that slowly declines and fades away. Your mentor should also be able to quickly spot when you are heading down the wrong path, and will know how to guide you back on track toward your ultimate goals. If you have not yet decided on your specific goals for a career in music, it is crucial that you figure them out as soon as possible. Read this music career goals page and learn how to dig deep and identify your biggest goals for music. 3. Has already helped many others achieve success in their music careers (and can prove it!). Unlike with many other industries, building a successful career in music does not require special certifications, college degrees or standardized testing of any kind. That said, anyone can easily ‘claim’ to be an expert in the music industry, when in fact they have done very little in their own career. As you are looking for a mentor to help you build a career in music, it is very important that you avoid following the advice of people who do not TRULY understand how the music business works and what will make you valuable to it. One of the best ways to identify a mentor who CAN help you in your music career is to look at success of the musicians he is currently training (or has worked with in the past). If the mentor you seek is truly worth investing in, he will not spend a lot of time trying to ‘convince’ you of his musical skills, music business understanding or strong industry connections. Instead, he will let his reputation do all the talking for him. A great music career mentor has already helped many musicians reach their own success. As a result, these musicians have a lot of gratitude and volunteer to provide testimonials of their achievements. You should be able to easily find testimonials like this all over the website (or elsewhere) of the mentor you are considering. After mentoring and training musicians around the world to achieve high levels of success, I can tell you from experience that finding a mentor will make a MASSIVE difference in your music career. Whether you are just starting a career in music or have already worked in the music business for some time, it is absolutely essential that you find a great mentor who can help you reach your full potential as a professional musician. Get started building a highly successful career by reading the information on this music career mentor page. Still not sure about working together with a mentor? Take this free music career analysis to learn the details of your current strengths and weaknesses as a musician, and see if working with a mentor is right for you. Learn how to get started building your music career in this music career training page.